The ISD oversees the transfer and operation of select public elementary schools and puts them under the management of qualified Innovative School Operators. The State Board of Education expects to select five qualifying schools for transfer to the ISD over the next few years. The ISD will start with one school in the initial 2018-2019 academic school year. Additional schools are expected to be selected and transferred to the ISD in the 2019-2020 school year. 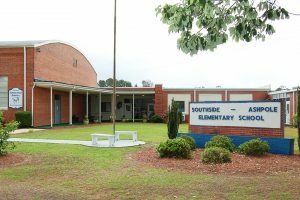 The Innovative School District’s inaugural school is Southside Ashpole Elementary in Rowland, NC, a rural community in southern Robeson County. The school has approximately 260 students enrolled in kindergarten through 5th grade. In coordination and cooperation with the local community and the Public Schools of Robeson County, the ISD will launch its 5-year intervention at Southside Ashpole beginning in the 2018/2019 school year. In partnership with Achievement for All Children, ISD’s intervention strategies will include instructional coaching and monitoring to ensure that school lesson plans align to NC Standard Course of Study standards—with a strong focus on reading and math achievement; conducting staff development training to build teacher capacity in instructional best practices; and providing comprehensive family and community engagement programs and activities to maximize human and financial support. These efforts and others, will help foster improved student growth and achievement. October 15, 2018 – The North Carolina Innovative School District (ISD) selected Carver Heights Elementary School in Wayne County for possible transfer into the ISD beginning in the 2019-2020 school year. ISD Superintendent LaTeesa Allen will make an official recommendation for the transfer of Carver Heights Elementary into the ISD to the State Board of Education on November 1, 2018. December 6, 2018 – The State Board of Education (SBE) voted unanimously to approve the recommendation by the Innovative School District (ISD) to transfer Carver Heights Elementary into the ISD beginning in the 2019-2020 school year. The recommendation and Board approval of Carver Heights Elementary, located in Goldsboro, NC, was based on quantitative and qualitative analysis, including an extensive review of school performance data, and discussions with district leaders, school administrators and community stakeholders. Wayne County Public Schools now has until February 2019 to either accept the transfer of Carver Heights Elementary into the ISD or close the school.